City Care have an “Extreme Care Cyclists Merging” sign on Waltham Rd northbound between Eastern Tce & Rogers St, but there are no works at all affecting the cycle lane (or any part of the road), so no need for drivers to watch for merging cyclists. 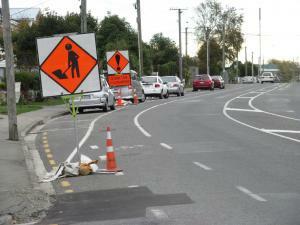 Why can’t City Care take down or cover the Cyclist Merging sign when they remove the cones & suchlike from their worksite? If they leave these signs up when they do not apply, drivers and cyclists will just ignore them in future.